FIFA banned players from wearing Beats in World Cup stadiums and official media events, distributing headphones made by official sponsor Sony instead. Ambush marketing is the act of a product or service trying to attach itself to a big event without being an official sponsor of the event -- and without paying the big bucks of sponsorship. While VISA® "Is Everywhere," some brands only shine during their moments of ambush. As consumers we expect a certain quality of product from the official sponsors. The official sponsors invest a lot of money, energy and time in hopefully delivering a quality product or service. Samsung Gives England's World Cup Squad Galaxy phones. While there doesn't seem to be an official phone sponsor for the World Cup, there is a social networking/media deal with Sony. Samsung has been on the other side of this game as the official phone sponsor for the Sochi Olympic games where they required the athletes to cover up any trademarks on a phone that were not Samsung. Here's a link to how brands can create social networking marketing strategies around the World Cup, or other events. Be mindful that your actions may constitute prohibited ambush marking. How about being the official sponsor of Brazil ... that is a tongue-in-cheek sponsorship of former international footballer and Talksport radio presenter Alan Brazil. FIFI asked Twitter to block improper and unauthorized uses of the World Cup logo. Take a look at the letter from FIFA to the teams regarding the official stance on using the FIFA and World Cup trademarks. Might official sponsors need their own ambush strategies in place? News reports of potential unrest and violence surrounding the World Cup have all the brands creating real-time marketing to address varied scenarios. Hyundai v Volkswagen; Beats and more - another update on trademarks, brands and the World cup. Ambush marketing, the act of a product or service trying to attach itself to a big event without being an official sponsor of the event, is alive and well surrounding the Sochi Olympic Games. American Apparel Strikes Marketing Gold - The company released a line of "Principle 6" clothing which includes a variation of language from the Olympic Charter. The Canadian Olympic Committee thinks a LaBatt beer commercial featuring a large Budweiser blimp designed to look like a hockey goal light, along with scenes of fans in Moscow, is a little too close. While Budweiser has an affiliation with the US Olympic Committee, LaBatt Brewing Company is not a sponsor for the Canadian Olympic Team. And, more from the Canadians, they Canadian Olympic Committee sued outerwear/cold weather brand NORTH FACE for launching a line of clothing in Red/White featuring the maple leaf and referring to the clothing line as the "international collection" ready for "village wear." Samsung, an official sponsor of the Sochi Games, gave the athletes a Galaxy Note 3. But, there was another "note" included in the gift bag saying cover up logos on any other phone you might be using. Samsung, like the other 10 official sponsors of the Winter Games, does not want their competitors' trademarks on display. The City of New Orleans will enforce "clean zones" from January 28 to February 5 to comply with NFL policies to thwart ambush marketing. Read more about the City of New Orleans efforts. Read more about how ambush marketing can de-value a costly sponsorship. Here's a look at more press on Ambush Marketing surrounding the 2012 Olympic Games: Australia's Olympic Committee, enforcing a 30 day ban on none approved ads, required the industry lobby group, Australian Mining - This Is Our Story, to pull a television and online ad featuring the 10-time world champion and Olympic gold and silver medalist Ann Meares. Meares, unaware of the launch of the campaign, appears in the video in cycling gear branded with her sponsor BHP Billiton's logo as she talks about her campaign to win gold in London. Meares has also been required to remove a TOSHIBA logo from her racing clothes. And the Australian Olympic Committee is actively monitoring consumer electronic companies for any engagements in ambush marketing. , unless of course its "fish and chips." 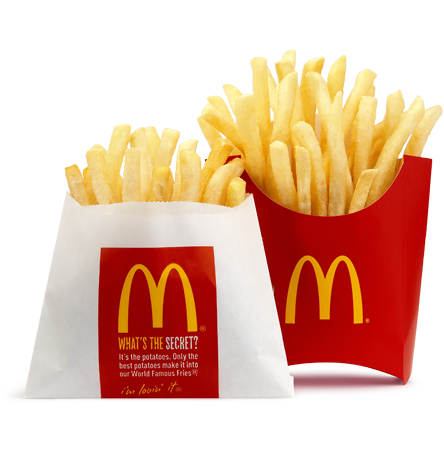 Maybe a cleaver ambush marketing team could show up dressed in french fry or "chips" costumes to an event? Or, what if folks decided to not order any fries at McDonald's? Could McDonald's exclusive rights back-fire?